Watch day two of the third Test between Windies and England, live on Sky Sports Cricket from 1.30pm on Sunday. 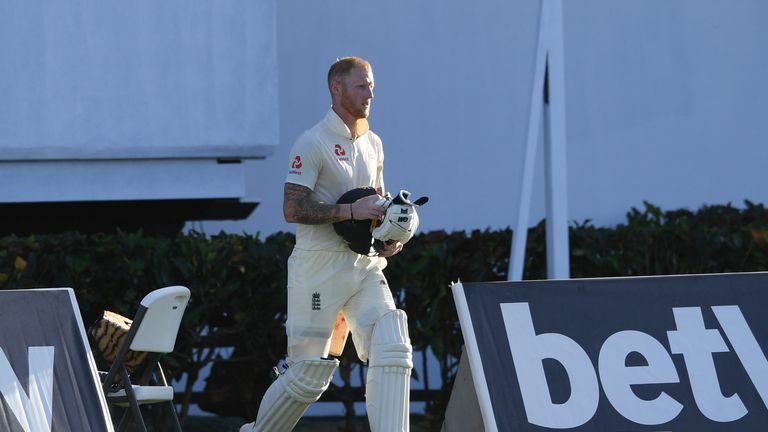 Keaton Jennings faltered again, Keemo Paul impressed before Ben Stokes led England's fight back - all you need to know from day one in St Lucia. Ben Stokes and Jos Buttler rallied England after a familiar batting malfunction as the tourists recovered to 231-4 on day one of the dead-rubber third Test against Windies in St Lucia, writes David Ruse. England - who had been dismissed for 77, 246, 187 and 132 in their four previous innings in the series - slipped to 107-4 in Gros Islet, with the recalled Keaton Jennings making just eight during a 43-ball knock Sky Sports Cricket's Michael Atherton described as "gruesome." But Buttler (67 not out), who was dropped on nought, and Stokes (62 not out), passed fit having suffered a bruised right heel, shared an unbroken stand of 124 - their side's first century partnership of the series - as England began their bid to avoid a 3-0 whitewash following heavy losses in Barbados and Antigua. After an agonising 43 deliveries Jennings tamely steered Keemo Paul to the slips as he lost his wicket in an all-too familiar fashion. 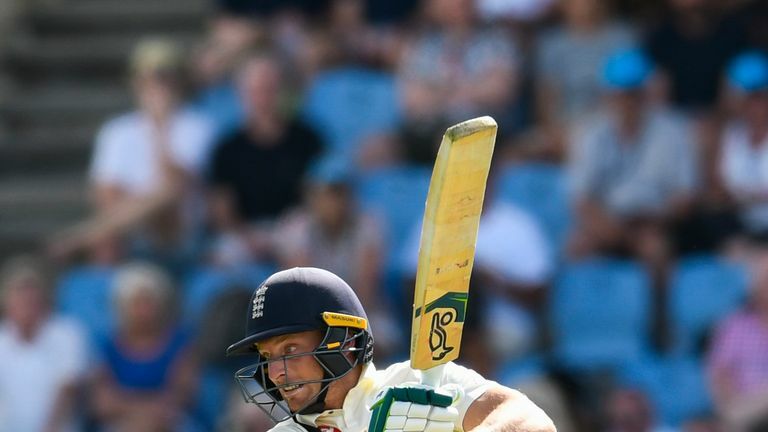 Having been afforded just 14 days between the end of the first Test, after which he was dropped, and being recalled for the third Test, the England opener was unable to correct the errors that plague his game as departed for just eight. For Windies Paul showed he was more than able to replace banned captain Jason Holder, with the ball at least, taking the first scalp of the visitors innings during a fiery and accurate spell. Watch the action from day one of the third and final Test between Windies and England in St Lucia. England managed to bring up their first century stand of the series, as Stokes and Buttler battled hard to drag England back into the match in Gros Islet - sharing an unbeaten fifth-wicket partnership of 124. Selection conundrums continue to trouble England with their team for the third Test perhaps portraying the muddle mindset the team are currently battling. Jennings' return to the side came despite having no further time out in the middle to get himself in any better nick there and there was also consternation over Bairstow's move up to three proving short-lived. The wicketkeeper-batsman has arguably been England's second best batsman over recent times, behind captain Joe Root, but has moved down to No. 7 in the current batting line-up and will most likely spend most of his time out in the middle batting with the tail. Additionally, the decision to drop Foakes - who was passed fit despite injuring his hand whilst batting during the first innings in Antigua - also caused much debate. The Surrey gloveman has been impressive behind the stumps since taking over from Bairstow in Sri Lanka and although he had made just 55 runs in the first two Tests, only Stokes, Bairstow and Rory Burns had scored more runs than Foakes prior to the start of the third Test. With just one Test match, against Ireland at Lord's in May, before the Ashes begins In August, England seem unaware of their best XI and the players best batting positions! Michael Atherton: "The real criticism to be levelled at the selectors is the lack of a top-order batsman in the initial squad of 16 when there were three spinners, plus and seamers sat on the bench. To not have one spare top-order batsman in this part of the world on up-and-down pitches against a class pace attack [is the issue]." Alzarri Joseph dismissed Ben Stokes by taking a fabulous catch off his own bowling, only for the Umpires to call Stokes back on to the field as it was a no ball! Mark Butcher: "This is something that was always going to catch up with cricket, it's now 16 years after we had the first T20 competition and as the younger players come along, their grounding in the game is in striking the ball, whereas our grounding in the game perhaps was not. "I don't think it was until 15 years into my career that I went into the nets with the express purpose of hitting every ball for six! Perhaps the younger guys are learning the game in a way that you hit the ball first and learn to stop it later - that will have an effect on the way that Test matches go. "We'll either have huge scores with balls going out of the ground, everything happening at 100mph, or, as we've seen from all teams but particularly England, you get collapses that take a session to take hold. At the minute that's where England are. They're stuck between a team that can go out and be incredibly attractive or they can be incredibly spineless and get knocked over for nothing." 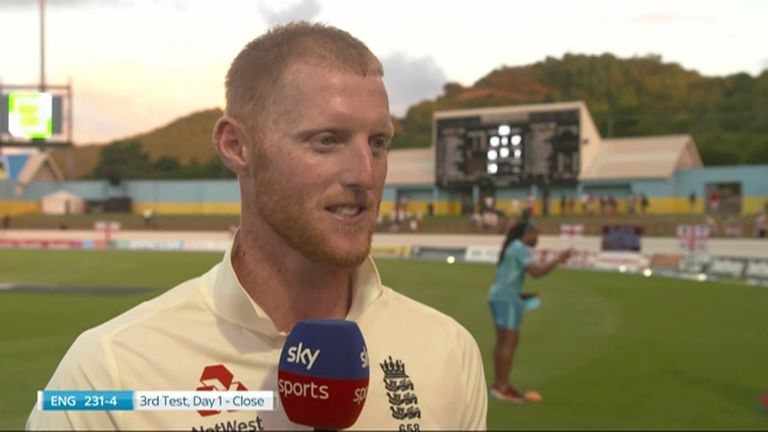 Ben Stokes reflects on helping England recover to 231-4 on day one of the third Test and tweaks he has made to his batting method. Ben Stokes: "We have been really disappointed with the way the we have played. This is still a challenging wicket and not too dissimilar to what we have been playing on and to come off only four wickets down we are very proud of that. "I looked at some footage of when I played Lord's previously this morning and I have been thinking about going back to that technique for a while and I watched it this morning and I went out with it today. "You can take looking at yourself doing well and take confidence from that and I think because I watched that this morning I took it out there with me and I think in the back of my mind, knowing that I had had this technique and it had worked for me, I think it gave me confidence." Watch day two of the third Test between Windies and England, in St Lucia, live on Sky Sports Cricket from 1.30pm on Sunday.